It is an unfortunate fact that people living with HIV/AIDS in the San Francisco Bay Area still face harassment and discrimination in employment, housing, and public accommodations. Yet many of these injustices go unchallenged due to the time, energy, and stress of asserting one’s rights while struggling with the day-to-day challenges of managing a chronic medical condition. Panel attorneys Michael Bracamontes and Ryan Vlasak have dedicated their law practice to providing a voice for clients struggling against workplace discrimination, wrongful evictions, and unfair housing conditions. Michael and Ryan joined ALRP’s referral Panel in November of 2008, shortly after opening their firm. They have consistently shown a strong commitment to assisting ALRP clients in the areas of landlord/tenant, employment, personal injury, and civil rights, and deserve special recognition for providing consultations to over 55 ALRP clients in the short time they have been on the Panel. They are highly regarded by ALRP staff for their reliability and willingness to provide free legal consultations to ALRP clients, regardless of whether the client has a case that will ultimately lead to direct representation. They welcome the opportunity to talk to clients and to empower them to make informed decisions about their legal issues. Michael received his law degree from the University of California at Berkeley School of Law. During law school he was involved with the Workers’ Rights Clinic where he developed his interest in representing victims of civil injustice. Ryan received his law degree from the Temple University James E. Beasley School of Law in Philadelphia and moved to the San Francisco Bay Area in 2005, where he worked with Michael at a civil litigation firm. The two decided to start their own practice in October of 2008. According to Michael, it was an unsettling idea to start a new firm right in the middle of a recession, but they both felt strongly that they wanted to focus exclusively on plaintiff-side litigation and knew it was the right time to make the move. Since they opened their doors they have had no shortage of clients. Their next challenge will be to expand their firm and manage that growth responsibly. 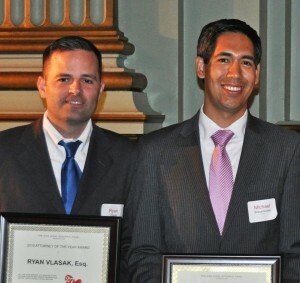 ALRP is truly grateful for Michael and Ryan’s dedication to public service, their diligent work on behalf of ALRP clients, and their passion for defending victims of civil injustice.